I love salsa, it may as well be a food group (really anything tomato based), throw some fruit into the mix and it’s an instant siesta in my mouth! 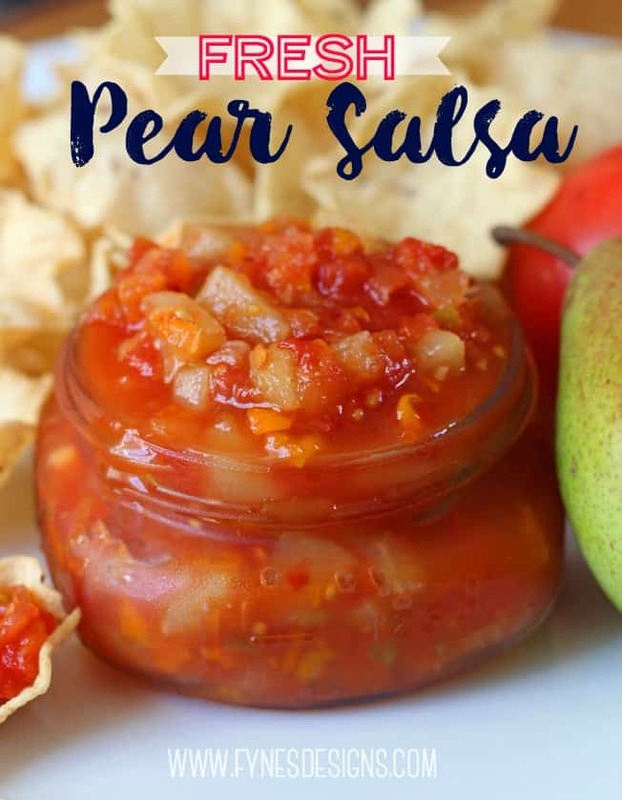 One of my favourite treats is chips and salsa; so today I wanted to share a yummy Sweet and Spicy Fresh Pear Salsa recipe with you that is on the top of my list. 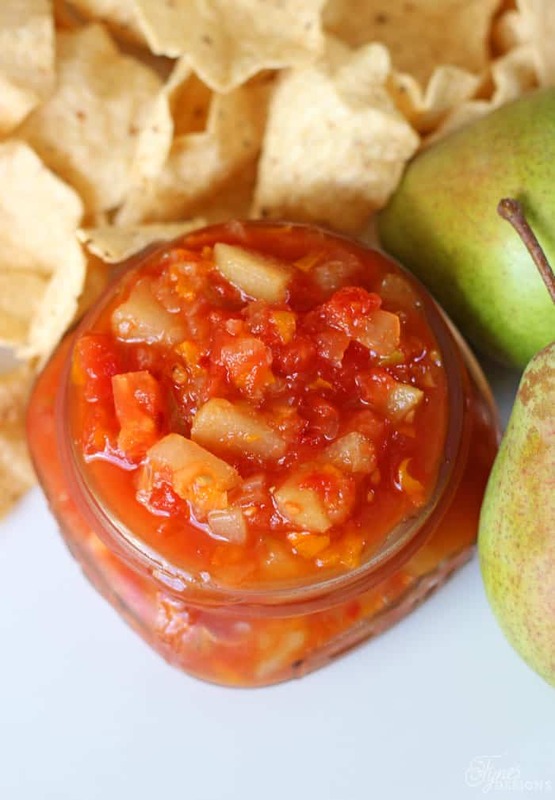 This pear salsa recipe is one of those things I make when I have a bunch of stuff in the fridge that is getting on the withery side, and of course in the early fall when tomatoes and pears are abundant. It can be executed in a few ways- the dump a bunch of stuff in a pot and let boil its heart out, then eat it all in one sitting (which is usually my method), or follow the recipe and preserve it for enjoying down the road. 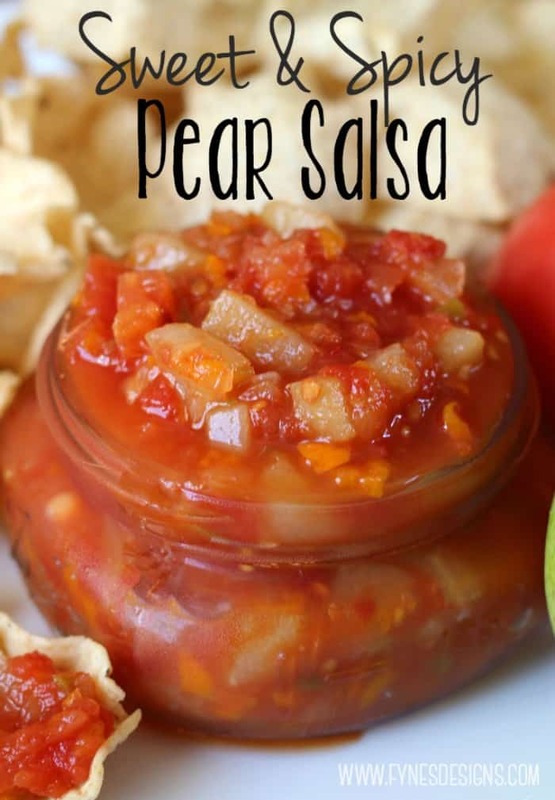 Prepare this yummy pear salsa for your next get together. Make and bottle or enjoy when cooled with nacho chips, or over your favourite dish. Bring to a rapid boil, reduce heat to medium high and continue to boil for 20 mins. Reduce heat to medium low and simmer for 1 hour until pears have softened, but still maintain their shape. This fresh Pear Salsa is so yummy, you’re more than likely going to want to save some for later. It will stay fresh in the fridge for a few weeks, but if you’d like to preserve it for enjoying when tomatoes and pears are out of season you can find a step by step canning guide on the Bernardin website. The juicy pears and the yummy blend of spices create an ultra delicious sweet and spicy salsa blend, perfect for dipping, used as a salad dressing, or as a condiment on your favourite meat dish. Plus this pear salsa recipe is perfect for Weight Watchers, very low (to no) in points and a perfect addition to salad! I’m creating a list of cool new salsas to try this summer – pinning this! I love salsa with fruit in the mix and this looks yummy! I’m saving this recipe to make sometime soon! Have you canned this using hot water bath? Or only with a pressure canner? I actually just put it in the jars really hot, and heat the lids in hot water, once they sit they seal themselves.